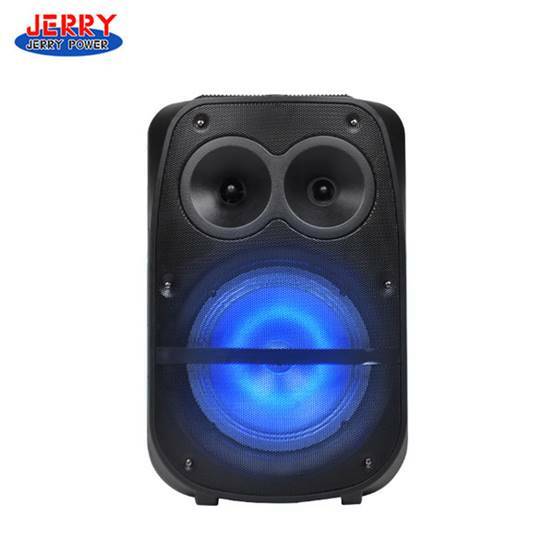 This JERRY Trolley Speaker with Bluetooth will surly bring in enough sound make your next event a great success. The portable handy speaker Bluetooth wireless connection USB/SD, compatible FM radio mic input jack remote control, and wireless microphone has the function of pause, play, rewind, repeat, fast forward, record, etc. Tourism and entertainment, park morning exercises, outdoor performances, dance teaching, business meetings, etc. 1. Its sounding unit adopts a dual magnetic circuit design, and is equipped with a permanent magnet external metal cover for antimagnetic. Trolley Speaker with Bluetooth does not affect other devices and is not affected by general electromagnetic signals. 2. Spread spectrum technology fully optimizes the new circuit design to ensure the signal expression. 3. The wooden box can effectively reduce the resonance of the box, making the sound quality more pure. 4. This product is compatible with a variety of audio devices such as smart phones, tablets, MP3s. 5. The retractable lever is made of PPT engineering plastic with a wear-resistant and solid pulley that allows the speaker to walk under a variety of roads. 1. Turn on the switch and charge it for about 8-12 hours. After being fully charged, the power supply will be automatically cut off, safe and reliable, and safe to use. 2. The audio uses a large capacity original battery, which can play 4-5 hours under normal circumstances, and in the state of the explosive music, it can play 3-4 hours. 3. When the battery sound is not completely used up, it can be fully charged to extend the battery life. 4. If it is not used for a long time, please charge it once in two months to ensure the service life of the battery sound.